"Come and be part of the fun! Join Lyman Gilmore wrestling. Everyone is welcome. Never tried it? Don't worry we will teach you everything you need to know to be more athletic, a valuable team member, and a successful individual." Please click here to go the the Bomber Wrestling Website. Sheldon Husky Folkstyle Wrestling Tournament. In the first tournament of her career, Bomber Wrestlings Amelia Glaz demonstrated commitment, perseverance, and dedication. During her wrestling match, Amelia kept a cool head, maintained focus and, was able to execute an arm drag, one of the techniques our wrestlers learn & practice regularly. An accomplishment such as this is difficult to do under pressure but Amelia showed us that even for our newer Bombers great things are possible! Congratulations Amelia! You’ve earned the Bomber Move of the Week! 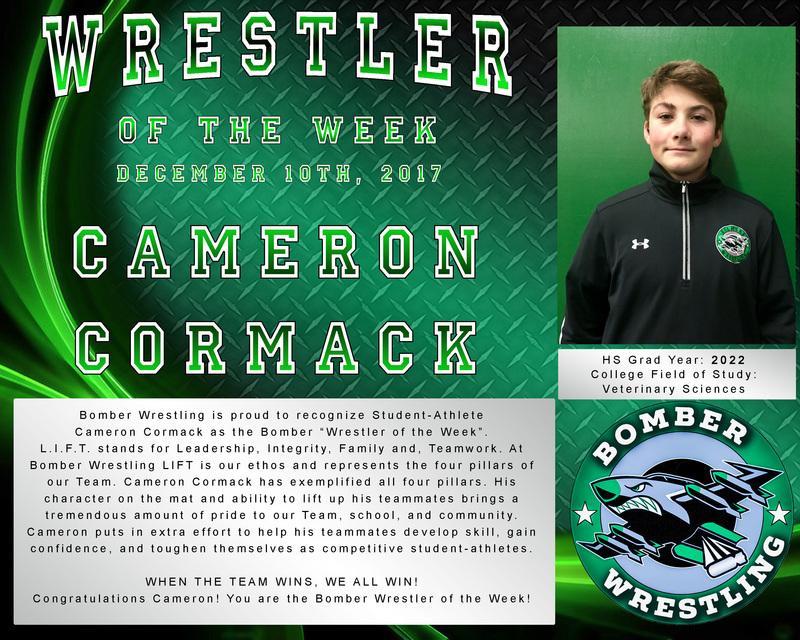 Bomber Wrestling is proud to recognize Student-Athlete Cameron Cormack as the award recipient for the the Bomber “Wrestler of the Week”. L.I.F.T. stands for Leadership, Integrity, Family and, Teamwork. At Bomber Wrestling LIFT is our ethos and represents the four pillars of our Team. Cameron Cormack has exemplified all four pillars. His character on the mat and ability to lift up his teammates brings a tremendous amount of pride to our Team, school, and community. Cameron puts in extra effort to help his teammates develop skill, gain confidence, and toughen themselves as competitive student-athletes. Congratulations Cameron! You are the Bomber Wrestler of the Week!